I’ve got home on the brain. Not my home for once, but my mom’s. I’m heading there for a quick visit next weekend, and I can’t wait. I always get a ton of fantastic ideas for decorating when I stay with her. Every wall is packed full of beautiful art—some by her, some by my aunt and grandma, some from her time living in Europe and more from her many years of thrifting. 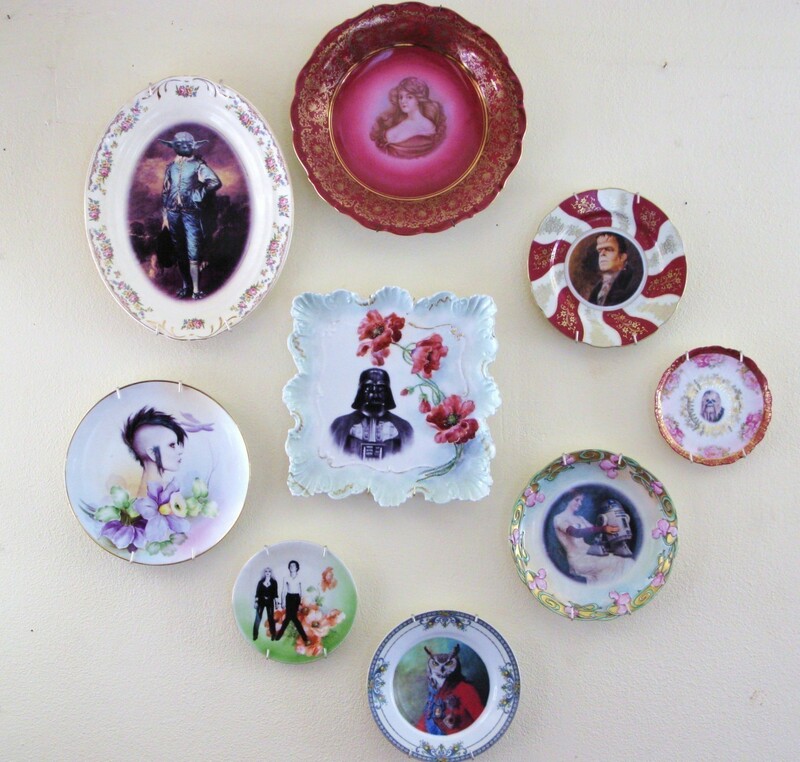 One idea that was passed down to her by my Grandma Mary, is the plate wall in her bedroom. 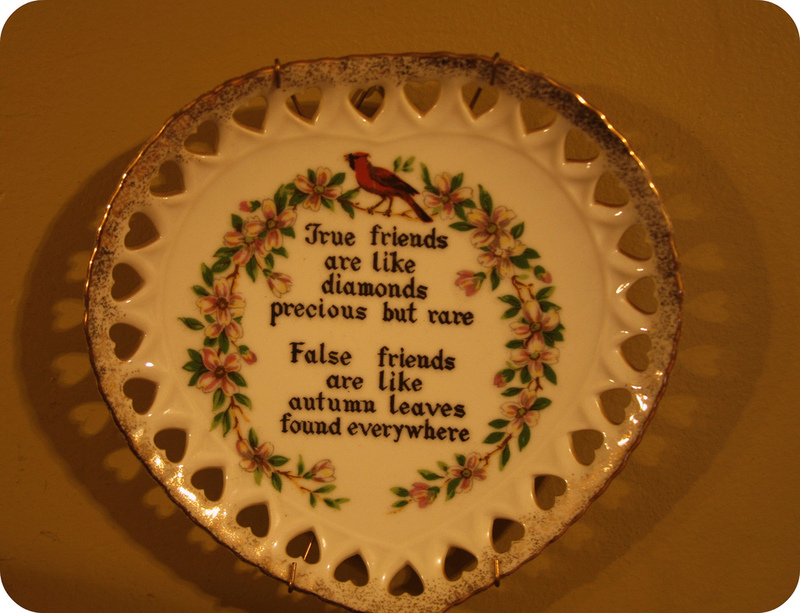 (Both my grannies had plate walls, now that I think of it!) I wish I had a picture of it, because it’s so pretty. 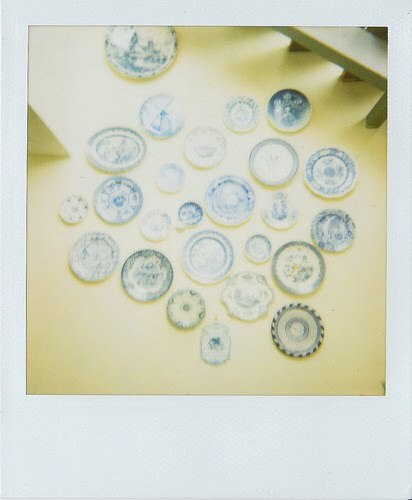 Vintage blue & white plates, hung in a pyramid shape, look divine on her buttery yellow walls above her bed. Seriously dreamy, like this pic. Anyway, unlike my dear Marmee, I’ve still got primo wall real estate up for grabs in my humble little house. 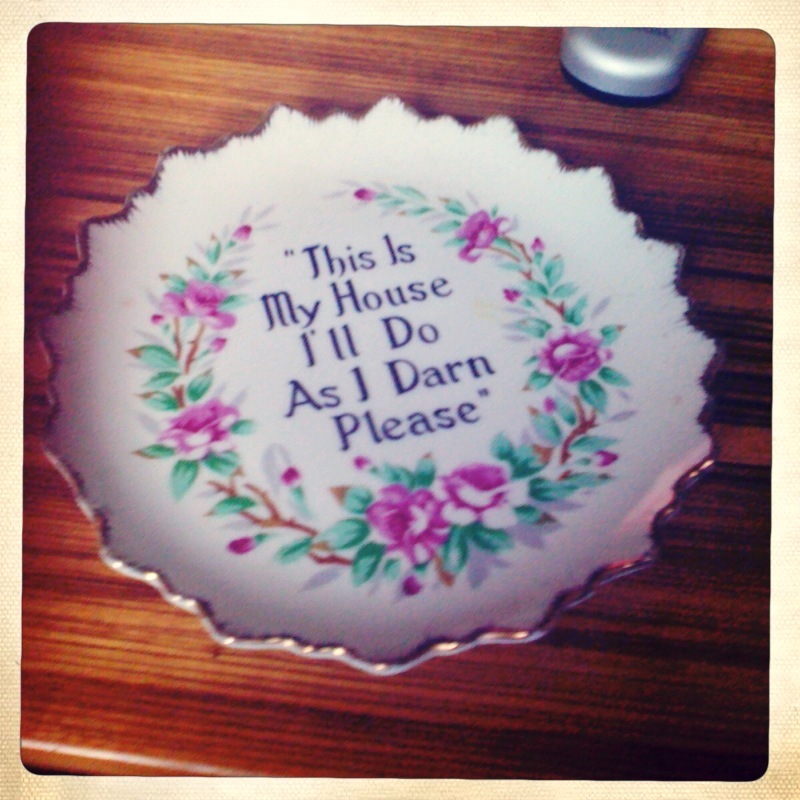 And the fact that I’ve been stumbling upon charming vintage plates at thrifts left and right, is getting me to think I should carry on the family plate wall tradition. My first order of business? 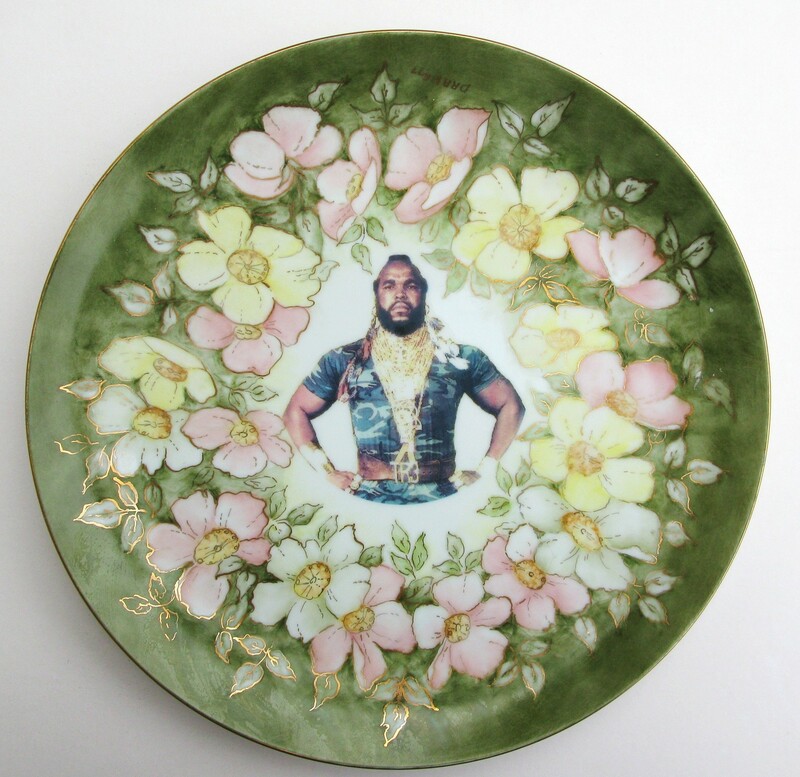 Beefing up my plate collection. You all remember this one I got during last week’s Savers adventure? Well, I got it’s sweet little buddy, too, which also came ready to hang. How adorable is that little border made of hearts?? I’ve gotten a lot of ideas from newly wed blogger Christina of Down and Out Chic, who documents her big-time obsession with plate walls. Browse the inspiring archives here. 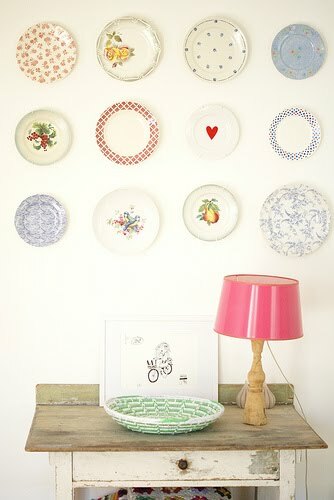 Hanging a collection of these quirky altered vintage plates like those found in this Etsy shop is a cute idea. Anyway, I’ll have to figure out which wall to start with. Once it comes time to start putting holes in the wall, I’ll be needing some help. It didn’t surprise me one bit that Design*Sponge has a DIY for hanging your own plate wall. Freakin’ geniuses over there, I’m telling you. Anyway, it’s been a big week, and I’m fixin’ to hit the hay early. As in now. This entry was posted in Uncategorized and tagged domesticity, family, vintage by highplainsthrifter. Bookmark the permalink. 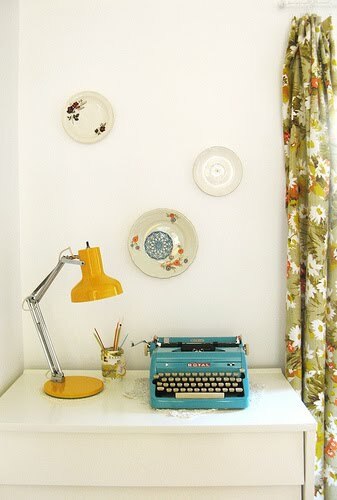 oooooo…i love the idea of a plate wall! take photos of all the lovely wall art at your mother’s house! :) have a great weekend. love this idea! I have a wall of pictures, but unfortunately we live close enough to the airport so ethey shiftvery time a plane flies over!